CALIFORNIA "state" court judge speak-truth when MOST nationwide state judges seemingly are bias." trained WON network,had known for years. employee for harming you, your family, your life. Judicial is about the money sadly." Confirm by simply watching the actual video." U.S.C.A.Title 42-sec.1983 claim filed against cps and or other additional Tort-Related Injury pursuant to,but not limited to such fourteenth/first/fourth amendment. EMAIL US DIRECTLY:On your pro-se lawsuit today. It is common knowledge coast-to-coast sadly lawyer(s)do not seem to care when one is violated hence are not suing for those truly violated by a employee over @ DCFS. If the owner as media validate of the WON winning network, Melendez, was able to sue and win, her lawsuit for $50million in damages,her family winning such right to move forward with their damages suit per defendant(DCF) PRO-SE,SELF FILE, then there is no reason why you can't learn and educate/empower/achieve same. Good luck to you when suing by deadline,DCFS. 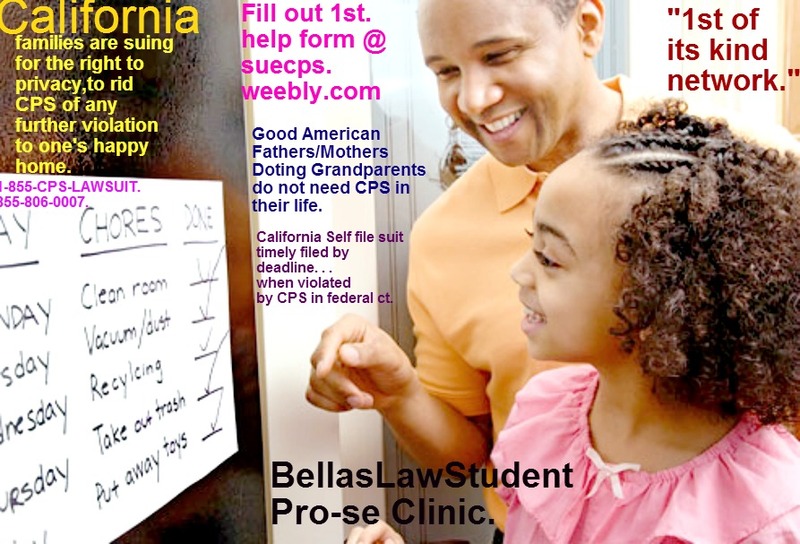 "IF LAWYER﻿ DO NOT﻿ CARE TO PROPERLY SUE CPS, and you are aware of your violation, and time is running out? FILE YOUR SUIT PROPERLY,PROFESIONALLY BEFORE DEADLINE. BEFORE YOUR CALLING OUR VERY BUSY OFFICE fill out HELP-Form ON THIS PAGE . NO FREE VIDEO CONFERENCE, E-POWER SESSSION, PHONE CONSULT WITHOUT the proper submission of your E-HELP FORM found on this site... Thank you." 929-277-7848. Department of Children Family "Services"
or my teen is at RISK." DO NOT WAIT UNTIL YOUR CHILD IS FURTHER INJURED,VIOLATED. SUCH ACTION STARTS HERE,AT BELLA'S,AND THE SUE CPS NETWORK. Deadline will indeed arise,sooner than your thinking by"waiting." 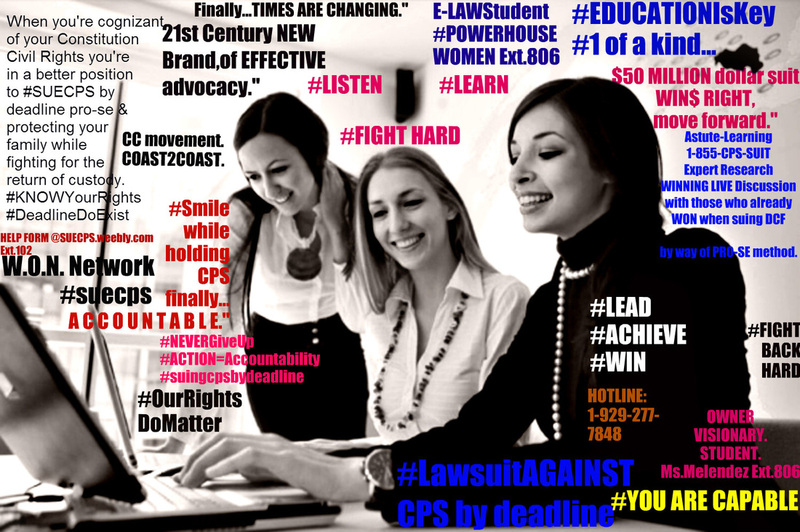 ,﻿One thing about our incredible EMPOWERMENT,CONSULTING,SWIFT-PRO-SE ACTIONABLE CLAIM RESOURCE NETWORK IS WE HEAR WHAT YOUR ADAGING ON CPS,AND MOVE TO TAKE ACTION,FOR WHICH ALLOW SO MANY TO FINALLY BE ABLE TO SUE CPS. Unique center-for which whether in california,to violated by Michigan DHS,OK DHS, to New Jersey,NEW YORK CITY tri-state,the violation(s)are the same...Just a different state,for which your time to sue ergo everyone is clearly limited,as case law support. Most who call our Bellas dept.ext.102 or ext.260 are violated. "not all.."but most...such violations continue to grow. 14th and or fourth amendment/9th/6th amendment et;al . An un-abusive employed/hard working caring family out of San Bernardino including a loving father/grandparent,both whose whose name not yet mentioned-until we have permission from her directly to utilize.Grandparent/Father are just about to move forward and file federal civil rights lawsuit;per cause of action;claims against DCFPS. Father has not even held his own child?Not even 1 photo/nor a visit by caseworker. But not BELLAS LAW STUDENT CLINIC. (DCFS has the child all-set-go up for "adoption even when DCFS see that the other bio-parent is clearly available and more than capable to properly raise,nuture his own child.Dad works.He is employed and not a danger at all to the little girl. The child's loving grandparent,in california is there to properly assist when it is warranted has her own home, where both can easily care for this very beautiful little 5/6 year old child who need her bio-family.THIS IS THE BEST INTEREST OF THE CHILD. D C F S caseworker,in San Bernardino continue to negate;in violation of such rights. the child without child abuse;and or any neglect..."
"Yes your able to care for the child. Caseworker adaging to the grandmother employed/healthy/fit/of sound-mind is able to raise child,while father remain in state(family/juvenile dependency court)to procure custody(child currently remain everyone in foster care as we speak being mistreated." ) Caseworker advise meanwhile in 2013 advising grandmother she is able to yes have custody but caseworker is first waiting on her paperwork.This was 1 year ago." Grandparent has successfully provided all of what the caseworker at california DCFS was in warrant of and in a timely fashion so she can bring her beautiful little grand child home finally..."
Grandparent also seen child 1x-while in foster care,clearly neglected/abused and or severely mistreated. Hair is all "cut off." Clearly the child has been neglected for which our staff shall not share all of the horrid fact(s)only excerpt from such suit. FIGHTING TO GET THIS FAR,as she seek custody of the child." DCFS shall continue to be sued,as per state/caseworkers,until final justice is visible. This lil girl has a loving doting un-abusive father, and loving grandparent,but yet is being harmed in foster care?Yet sadly,is about to be adopted-out even after false-promises to the biological family if not return to her available/fit/healthy and loving grandparent,and or able to go and live with her father whose fighting so hard to see this come to fruition. is NOT in the BEST INTEREST OF THE LITTLE GIRL,being abused currently and or neglected,in california wonderful,glorious "foster care system. "This little girl,"if she only knew she has rights,and can sue their pants off as a lawyer put it on our public informative support page for pro per litigants suing currently cps. 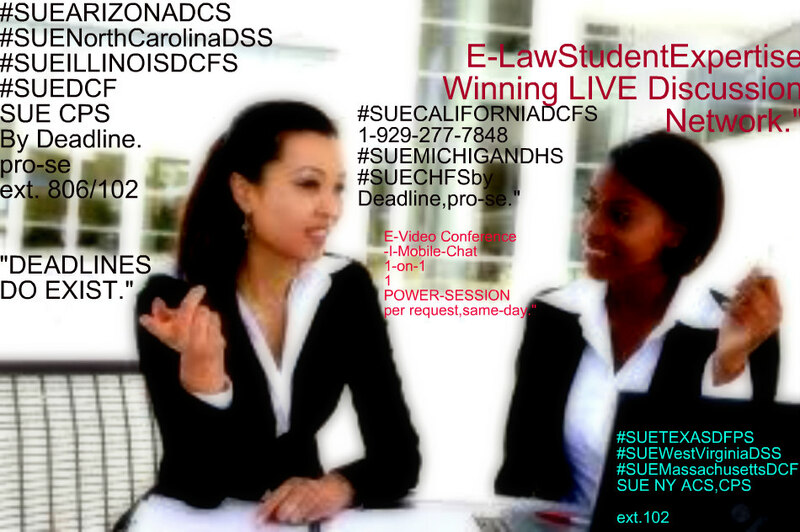 (Facebook under SUE CPS BY DEADLINE pro-se self file." Since she can't sue,and is about to be illegally-adopted,the parent(s)are suing and loving grandparent. BELLAS SUPPORT THIS FAMILY WHEN LAWYERS HAVE NOT BEEN THERE AT ALL FOR SUCH LOVING un-abusive dad and his mother(grandparent)and we will be here for them coast-to-coast-as long as humanely feasible,as the family prepare to file such warranted suit premise on many factor(s)experts fully agree,"supporting their family right to file pro per,self file timely against california horrid,abhorrent child protection services." WE COMMEND THEM ALL. including Jay Chapman,Elaine Donnelly,Paul Dwyer Esq. Moss Beach, Pacifica, Pescadero, Portola Valley, Princeton By The Sea, Redwood City, San Bruno, San Carlos, San Gregorio, San Mateo, South San Francisco, West Menlo Park, Woodside, San Jose, San Diego, Los Angeles, Adin, Modoc County, Alturas, Anderson, Shasta County, Bartle, Siskiyou County, Beckwourth, Plumas County, Berry Creek, Butte County, Bieber, Lassen County, Big Bend, Shasta County, Blairsden, Plumas County, Biggs, Butte County, Burney, Shasta County, Burnt Ranch, Trinity County, Butte Valley, Siskiyou County, Callahan, Canby, Canyon Dam, Cassel, Castella, Cedarville, Chester, Chico, Chilcoot, Clio, Coffee Creek, Corning, Tehama County, Cottonwood, Crescent Mills, Cromberg, Dorris, Dunsmuir, Durham, Edgewood, Etna, Fall River Mills, Forks of Salmon, Fort Bidwell, Fort Jones, French Gulch, Gazelle, Graeagle, Greenview, Greenville, Gridley, Happy Camp, Hat Creek, Hayfork, Helena, Herlong, Lassen County, Hilt, Hornbrook, Horse Creek, Hyampom, Janesville, Johnstonville, Johnsville, Junction City, Trinity County, Klamath River, La Porte, Lakehead, Lewiston, Likely, Los Molinos, Macdoel, Mad River, Manton, McArthur, McCloud, Millville, Mineral, Montague, Mount Hebron, Mount Shasta, Newell, Nubieber, Old Station, Oroville, Palermo, Palo Cedro, Paradise, Paynes Creekis, Platina, Pondosa, Portola, Quincy, Ravendale, Redding, Ruth, Salyer, Sawyers Bar, Scott Bar, Seiad Valley, Shasta, Shasta Lake City, Shingletown, Lake Tahoe, Somes Bar, Susanville, Taylorsville, Trinity Center, Tulelake, Vina, Vinton, Weaverville, Weed, Westwood, Willow Ranch, Yreka, San Francisco County, Alameda County, Marin County, San Mateo County, Sonoma County, Stanislaus County, Contra Costa County, Los Angeles County.